It is unclear whether Tümosan has already selected an alternative to AVL List (some reports indicate that Turkey might be opting for diesel engines from Ukraine) and in what way the cancellation of the Austrian-Turkish engine deal will impact the Altay MBTs future production schedule. Much will also depend on whether Turkey’s defense procurement agency, the Undersecretariat for Defense Industries, will award Otokar a contract for serial production of the tank. 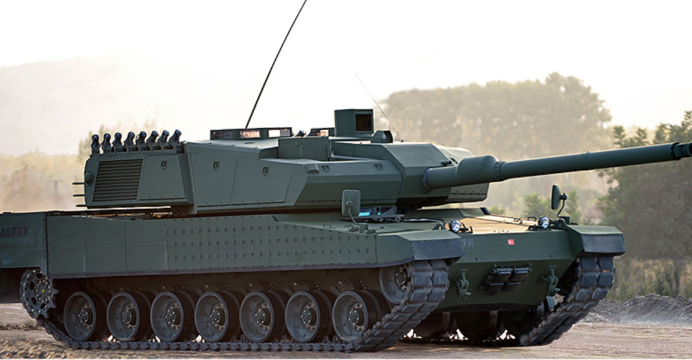 Otokar entered into a system development deal with South Korean tank maker, Hyundai Rotem, whose K2 Black Panther tank project serves as the basis for the development of the Altay. Both tanks share the same base design including the chassis, although the Altay is purportedly slightly longer, equipped with heavier armor, and, in comparison to the K2 MBT also sports a modified turret with composite armor. Both tanks are also armed with a 120-millimeter smoothbore gun, although the K2 Black Panther MBT is equipped with an automatic loader, whereas the gun on the Altay has to be loaded manually. Furthermore, the Altay MBT has a laser guided missile firing capability and is additionally armed with 7.62 millimeter coaxial machine gun and a pintle-mounted 12.7 millimeter machine gun up top. The Altay can accommodate a crew of four and with its German-made 1,500 horsepower engine can reach a maximum speed of up to 70 kilometers per hour (43 mph). Reports that Pakistan is interested in the Altay have to take into account that Turkey’s new MBT will be an expensive acquisition for the Pakistan Army since the Altay is based on Western tank designs and will be a NATO-standard MBT. Pakistan has traditionally relied on cheaper models such as the al-Khalid and al-Zarrar MBTs (both derivatives of Chinese-made MBTs) given that the Pakistan Army’s armor doctrine favors mass over class in order to partially offset the Indian Army’s numerical superiority. It is thus unlikely that the Altay will become the new mainstay of Pakistan’s armor force. If acquired, it will likely be only to supplement a cheaper armored vehicle procured under the so-called “Haider” program. The Pakistan Army is in the middle of upgrading its tank force. Among other things, Ukraine and Pakistan have recently started implementing a bilateral agreement for the upgrade of the Pakistan Army’s T-80UD Main Battle Tank (MBT). The Pakistan Army intends to procure hundreds of new MBTs in the coming years. T-123456 and The Lockean like this. Can Pakistan afford these in even remotely significant/substantial numbers? Or is Turkey going to give them away as aid the way US gave F-16's? so when are you buying it and how many units and for what cost give us the good news? also isnt the tank without a engine as germany MTU refused the license to let them build it the austrain company also refused them the engine citing erdogan the wannabe ottoman caliph and last i heard they forced a tractor manufacturer to make one but they failed now i see them being interested in old underpowered ukrainian 6TD engine well good luck to ya mate. A_poster, vstol jockey and Lion of Rajputana like this. Aren't you the guys at PA trying out the Chinese MBTs !? What happened to those plans...!? Check the above posts and Kindly let me know if any of one worthy to reply. You people are making hard effort to improve this forum but person like @OnePunchMan not let a single chance to waste your efforts. Every first post on my any thread from this guy just hate, trolling and abuses to my home country. Is this guy suffering from some phobia or living very next to LOC? AnGrz_Z_K_Jailer and T-123456 like this. what will power the engines .If that fails , what do you think the half a million strong PA is for ? They'd have a 10 man per tank manpower deployment .4 to man the tank and 6 to push it. But , please .Don't ever bring the topic of payment up.Good friends never discuss money .That's why the US is still Pakistan's best friend while Turkey and China are their " brothers ." AbRaj and Lion of Rajputana like this. Every first post one my any thread from this guy just hat, trolling and abuses to my home country. Actually I'm genuinely curious how Pakistan plans to afford substantial amounts of such a seemingly expensive tank. Unless your financial situation compels you to buy so few that they don't even really factor into a future conflict with India. I think Pakistan in its present situation of severe economic crunch, will find it very difficult to allocate funds to procure any new Mbt line, especially atlay which has a very perunit cost and has nothing in common with al khalid line, forget spares, maintenance even the ammo will be different. plus this would also give the picture that Pakistan is not satisfied with the performance of its current mainstay Al khalid which is why it is looking at alternatives in the first place, something which might upset China. AbRaj and Agent_47 like this. Altay tank have some problems with engines and anti-missiles defence. They are trying to solve this problems with Ukranian help, but Ukro-industry have seriouse problems, too. "Cheapest is a dearest", as small-brits say. Buy Russian weapon and vechicles - best quality for normal price. Dont worry about the trolling,its in some peoples nature,they will grow up eventually. The engine problem will be solved soon but Pakistan is more interested in some of the subsystems because the tank seems to be to heavy for your environment. Turkish Main Battle Tank ALTAY breaks cover.